I am concerned that sharing the following may be irresponsible. If this causes you to lose the same number of life hours that I have, then I will be definitely be ashamed-slash-delighted. But I’ve spent 83% of my eleven day staycation playing Tiny Tower. How could I not write about it? It’s become meaningful and important in my life. 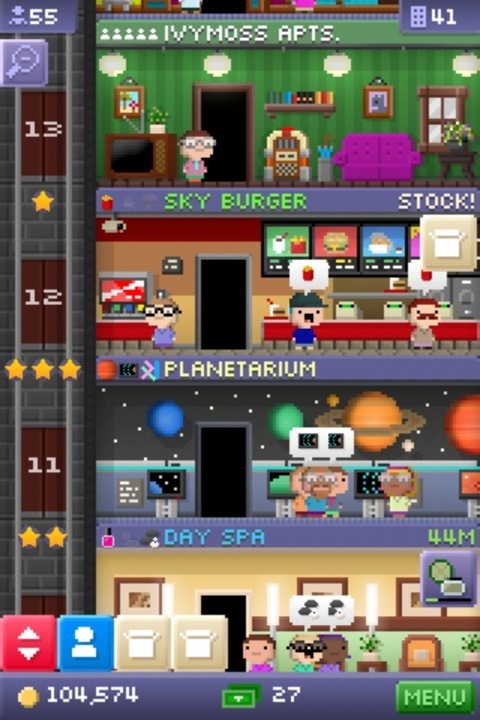 Tiny Tower is a sim game, a sort of game I am not generally wont to explore. In fact, I’m not much for video or computer games at all. Not counting that stint with Dark Age of Camelot. But I’m not counting that. Seriously. Let us never speak of it again. Right. 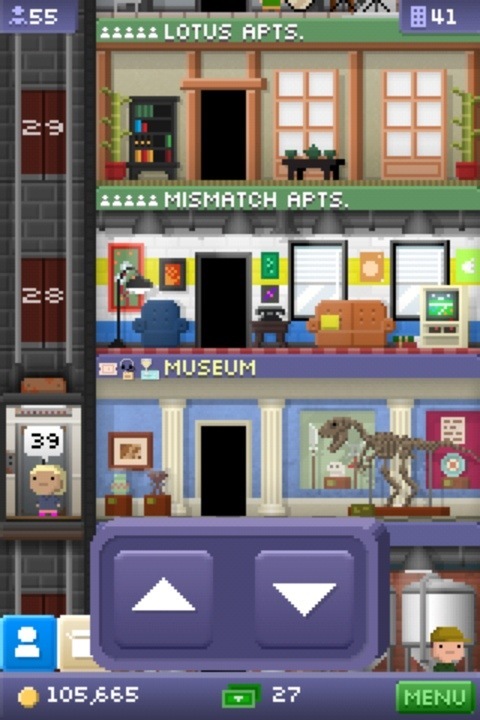 Tiny Tower? You build a tower of stores and apartments. 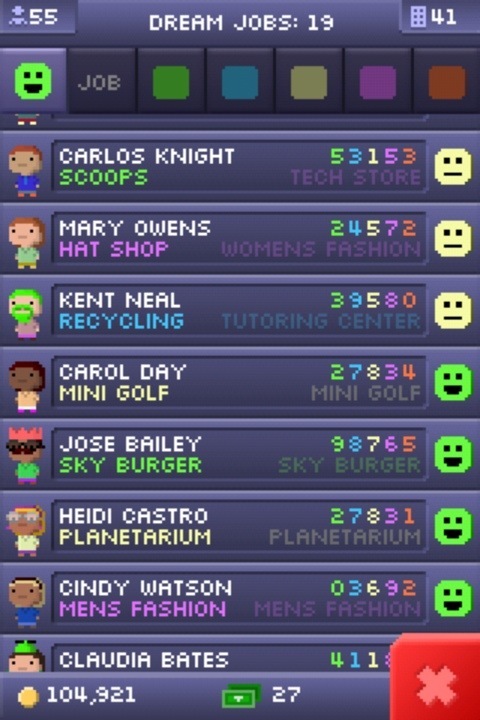 Little people buy stuff, you earn money, you buy more floors. People with varying aptitudes for doing stuff move into the apartments and you employ them in your stores so they can keep the store stocked with roasted duck or a 2 player game of mini golf. It takes about 5 minutes to earn enough money to build a new floor in the beginning. It’s all very exciting. Yay! I got a new candle store! But as the tower gets higher and higher, it takes progressively longer to earn the money to build a new floor and the new floors take longer to construct. The little people have dream jobs. If you have the kind of business that is his or her dream job, then you get all sorts of little bonuses. And this is the part that I think really drives a lot of the addiction. If you can just build one more floor of apartments, maybe *those* new people who move in will be dreaming of the jobs that you already have in your tower. Or your next new retail floor will be the bank that two of your little guys have been waiting for. But no. It’s a recycling center instead. And so I continue. Peddling my wares, building new floors, acquiring new tentants. Holding out hope that my next floor will be the tutoring center that will fulfill all of Kent Neal’s career goals. This seems like an excellent use of your time and many skills. Enjoy.